Thanksgiving this week, the holidays looming, and the occasional crazy weather day — you’re busy at this time of year, and we are too. That’s why I wanted to write just the briefest update about all things ‘Ghany so you’ll have in one handy place our most important fall and winter news. As most of you know, we’re in the final countdown of our Early Bird Registration season. You have from now until Midnight between December 1 and December 2, 2018 to register your Mini Camper, Term Camper, or Leader-In-Training at our lowest registration cost of the year. If you typically see relatives at Thanksgiving or over that weekend who help send your camper to us, it’s a good time to finalize plans for camp and lock in that rate as well as be sure to guarantee her spot before our wait list kicks in. And as an extra incentive, if you register on Cyber Monday, we’re running a special where you only pay a $250 deposit instead of our customary $500 deposit for Term Camp, and only a $150 deposit instead of a $300 deposit for Mini Camp. (The only risk there is waiting and then ending up on the wait list). As they say in TV ads, BUT WAIT…THERE’S MORE!! Our retail partner Everything Summer Camp is running a “Black Friday” event that should more rightly be called a “Black Tuesday to Black Tuesday” event. It starts TODAY, November 20th, 2018 and runs through next Tuesday, November 27th, 2018. With it, you get 10% off all ‘Ghany branded items. So if you’re looking to stock up your camper’s gear early, and save money to boot, now’s the time to do it. Just think, you can also wrap it all up and make it a holiday gift. And if you haven’t yet told her she gets to come back to camp, it’s even double the surprise and can be double the holiday gift! 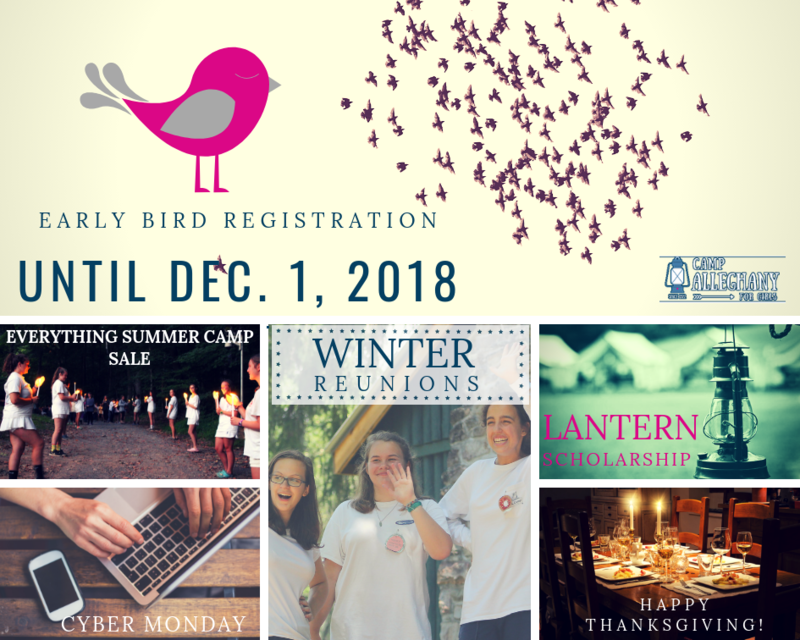 If you’d like to apply for our need-based Lantern Scholarship, or know someone who would be a great candidate for camp but who would need assistance, please remember that its deadline coincides with the Early Bird Registration deadline — everything is due December 1, 2018. If instead you’d like to donate to the Lantern Scholarship, you can do that any time of the year. Your donations help make camp possible for a needy camper and helps promote diversity at camp. All donations are warmly welcomed and we thank you in advance. Tuesday, November 27th is Giving Tuesday, which makes it a great day to donate to this excellent program sponsored by our active Camp Alleghany Alumni Association. We have a new page on our website called Events that we’ll be using to let you know about other camp offerings like off-season reunions, camp interest parties, and special things like our L.O.L. Alumni Weekend, and anything else that’s not actually camp but involves camp. Please bookmark the events page and check back often to see what’s happening. We hope to see you at one of these and ask that you please RSVP to help with head counts and for sending out reminders. This ends your brief News Update — if you have any questions please email me. I’d love to hear from you and help you in any way possible. In the meantime, please have a happy, healthy, safe, and stress-free Thanksgiving. All our love from ‘Ghany!